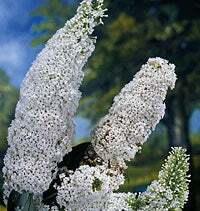 Buddleia White Profusion has heavy flowering sprays, and is also thought to be the most power butterfly attractor. 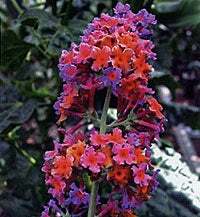 Many gardeners plant several butterfly bushes together, so they grow into a shrub-like clump with blooms in all the colors--purple, pink and white. 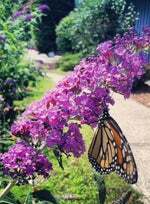 Butterfly Bush is a shrub-like plant that looks sort of like a compact lilac, grows quickly and blooms in mid-summer. But the name tells you all about it: Butterflies just cant resist the flowers, and flock to the plants when they're in bloom.